Originally until 1482 all of the Kathmandu valley was ruled from the city of Bhaktapur. 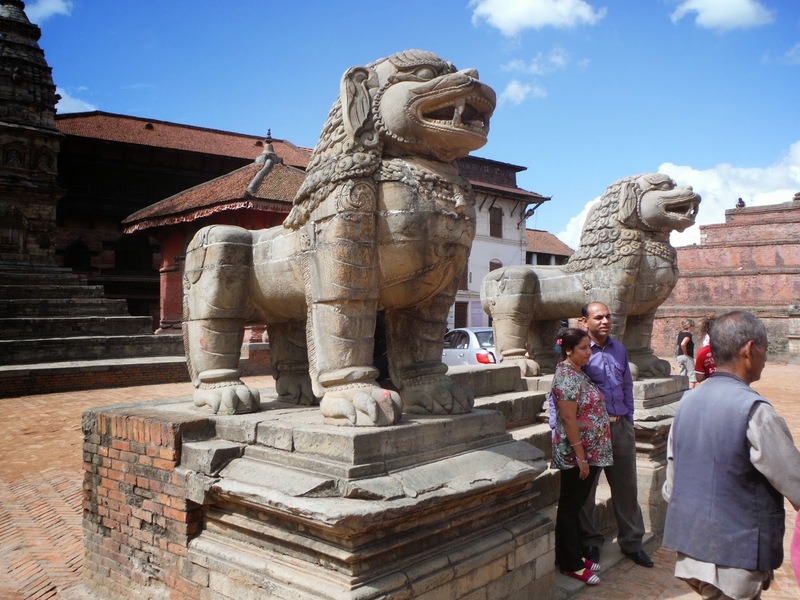 The king then divided his kingdom between his three sons. The present Kathmandu city was thus made up of three separate city-states ruled by the three brother princes. 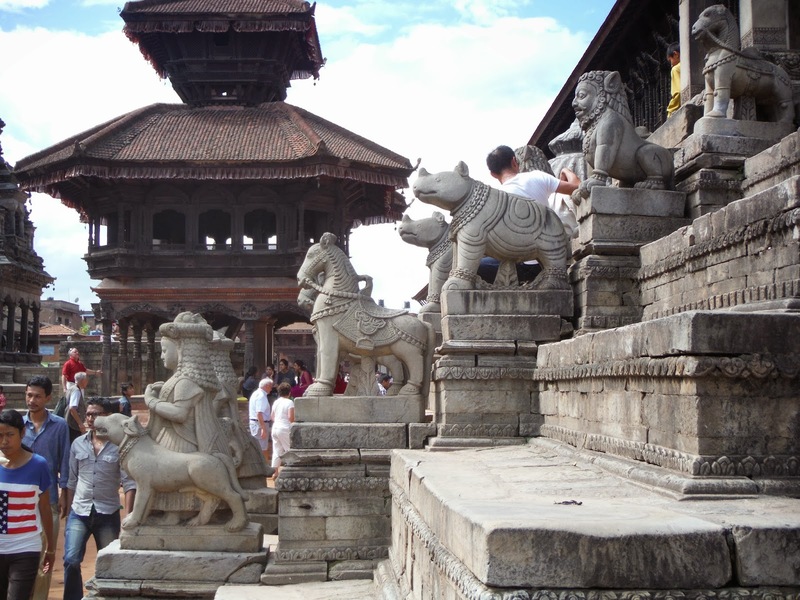 Each prince tried to outdo the others with the palaces and temples they each built in their own province. 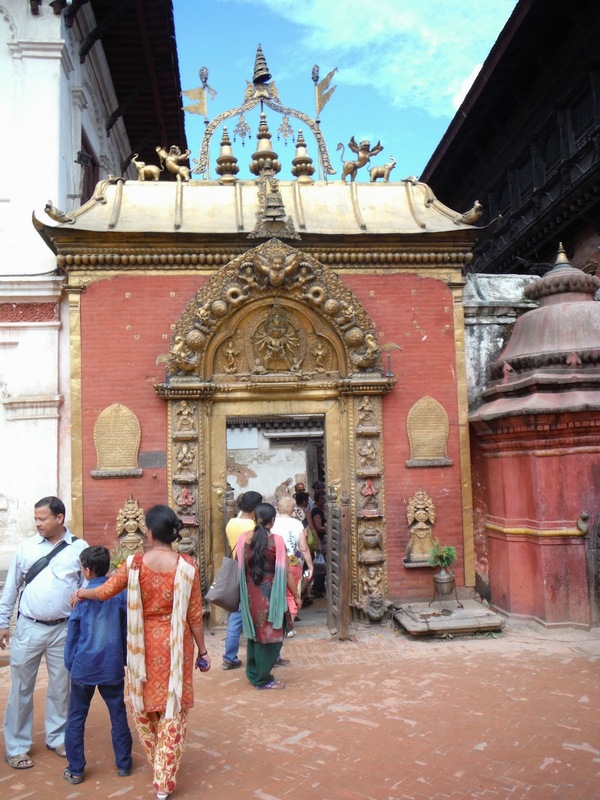 Today these towns, Kathmandu, Patan and Bhaktapur, have almost merged and are all part of Kathmandu proper, but each of the original towns has its own Durbar (palace) Square and accompanying temples and mandirs. We visited the old town of Bhaktapur, the best preserved and most separate of the three towns. 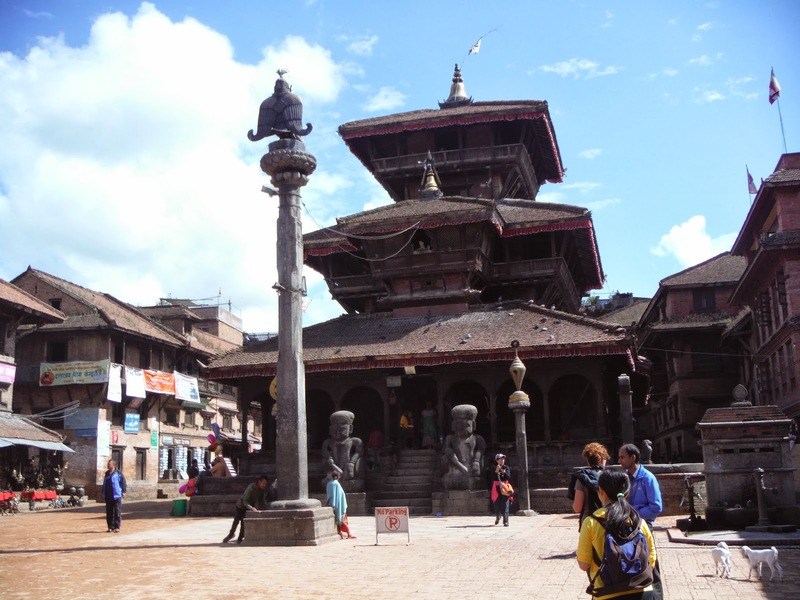 The town seems much more traditional than the other two and has been pedestrianised, which has made it much more pleasant to visit. 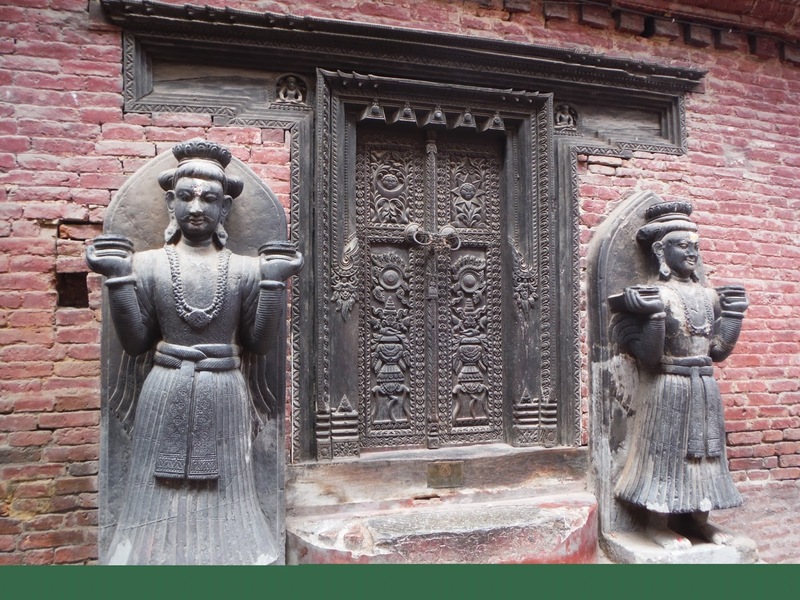 There are three famous squares filled with old buildings and statues, and I found myself awed by so much of interest to look at. Wherever you go in the town, beautiful intricate woodcarving was evident on many of the older buildings. 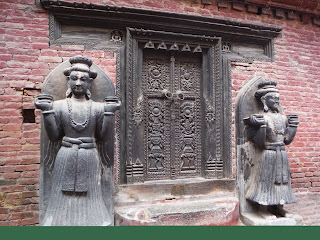 Again this is testimony to the woodcarving skills of the Newar people; decorative windows and doors for most of the older houses. 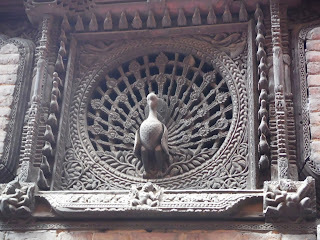 Even the peacock window, one of the town's famous sights, was situated on the first floor of a house down a narrow alley. 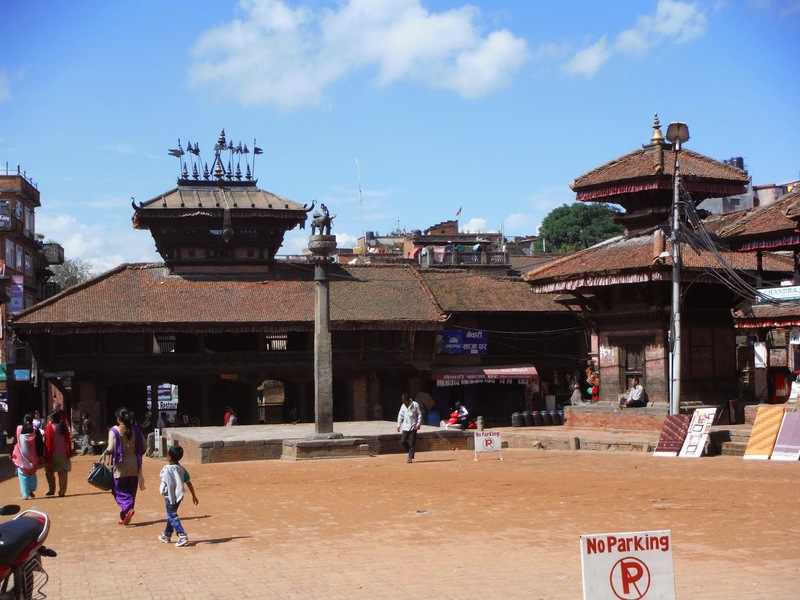 The magnificent palace in Durbar Square, the 'Palace of 55 windows', also now contains 5 chowks (courtyards) but was said to contain 99 before remodelling!! This may be a slight exaggeration. However the Golden Gate into the palace and the chowks were certainly very photogenic. 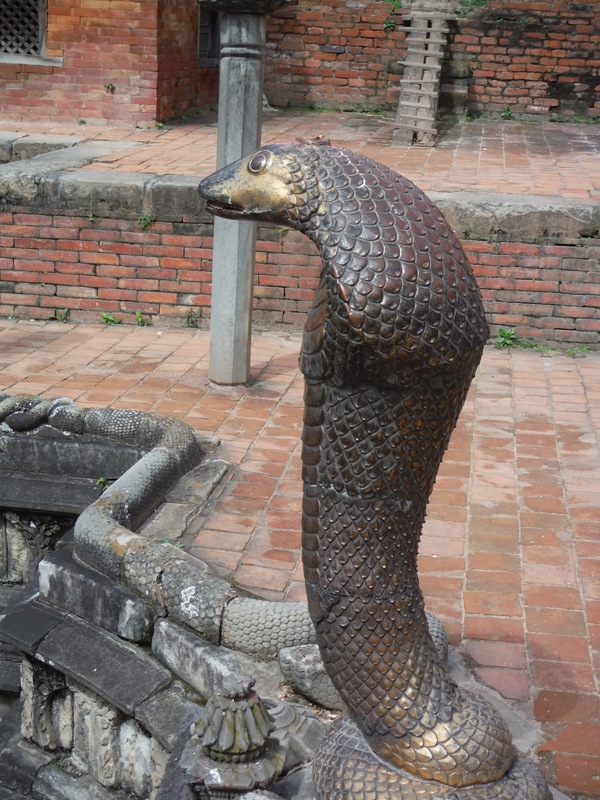 I loved the chowk that had the bronze serpent head rearing out of the pond in the centre. 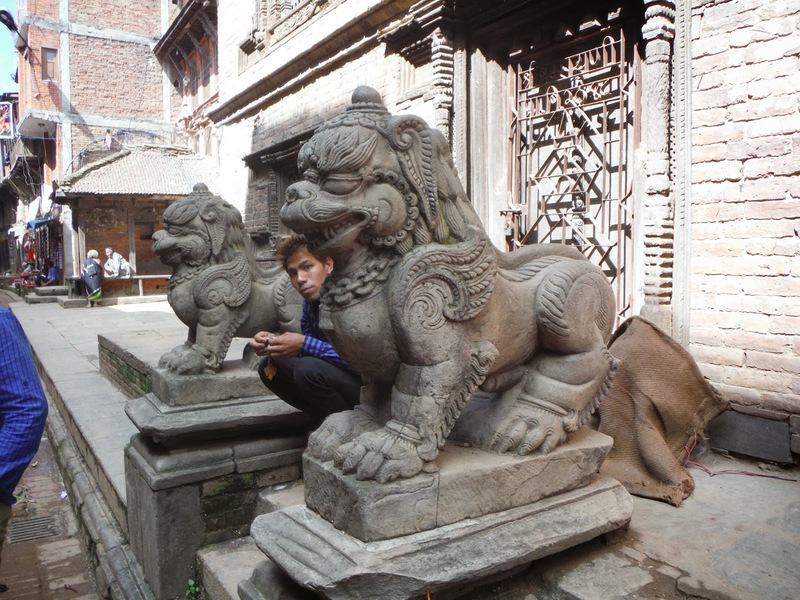 I was intrigued by the stone animals many of which guard the temples and palaces; frequently lions but also dragons and other mythical creatures. 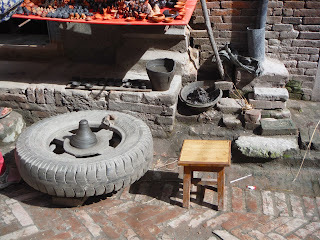 One area of the city is renown for its pottery. This potter had made his wheel from an old car wheel which he worked with his feet. 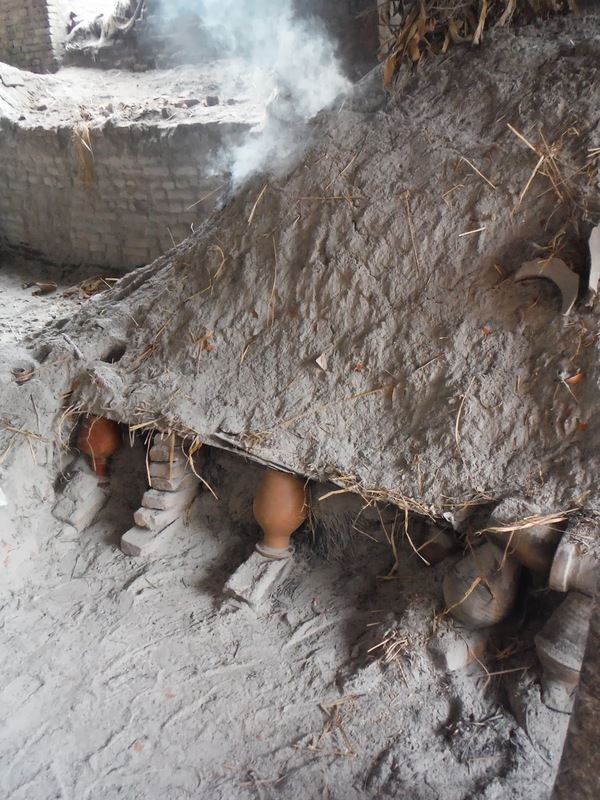 His pots were fired by piling them together, covering them with dry slow-burning combustible material and then allowing it to burn slowly, as if in a bonfire. One firing was still smoking as we passed by and the red hot pots were being raked out carefully from the ashes. 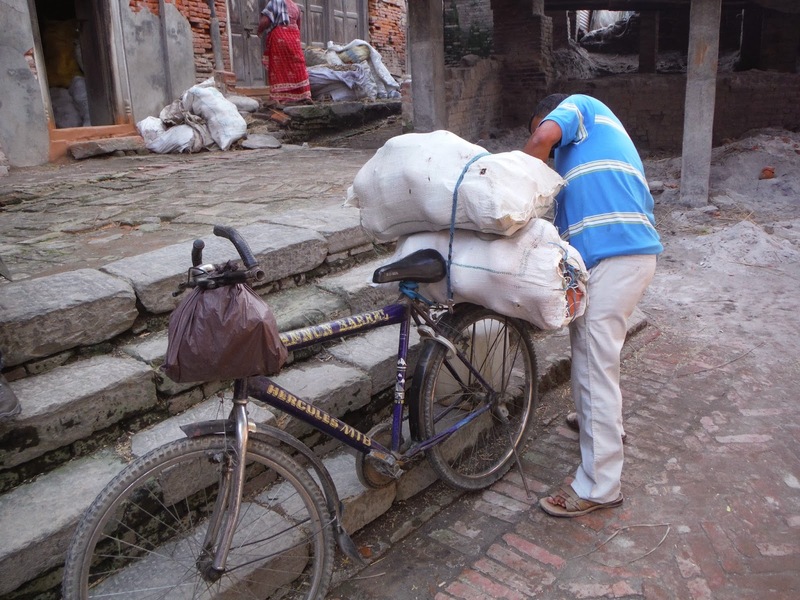 Later they will be loaded onto the back of a bicycle to be delivered to shops and stalls ready to sell. 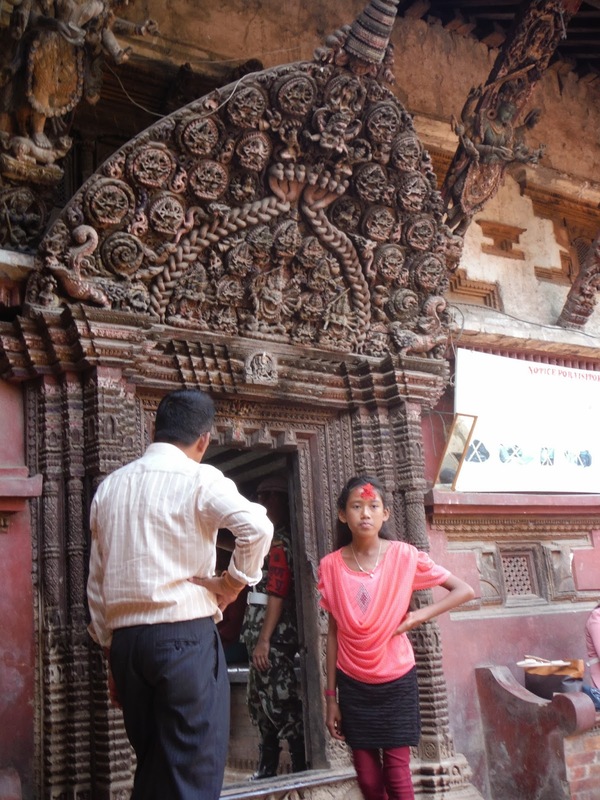 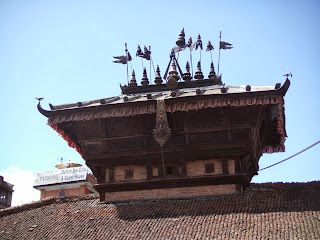 Bhaktapur is another place I shall be visiting time and again, as there is so much to see. Hi Ann, hope work doesn't happen too soon: I love the Kathmandu blogs. 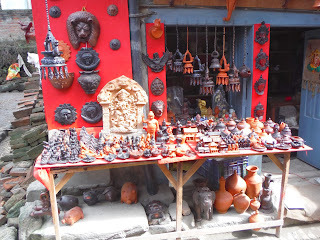 Did you spot the greenman in amongst the carvings?